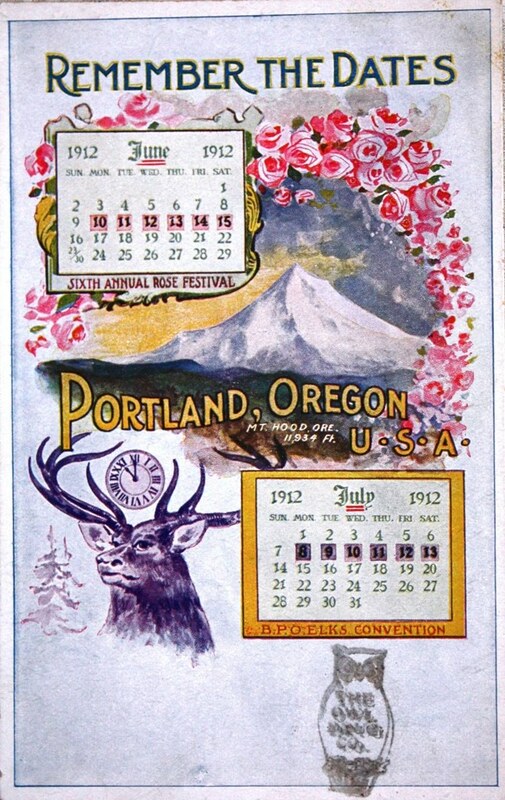 The 1912 Rose Festival began an extended celebratory season that reached its zenith in July, when two national delegations and thousands of revelers converged upon Portland. For seven days downtown was transformed, ablaze in light, with all the epic spectacle and impermanence of a Cecil B. DeMille studio back lot. The Benevolent and Protective Order of Elks had selected Portland as the site of their national convention, their "Grand Reunion." 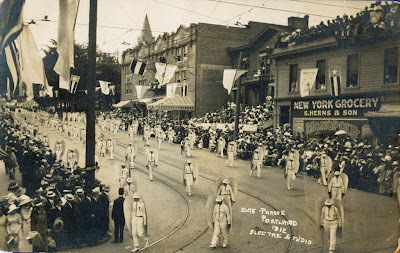 The city responded with the largest civic extravaganza since the Lewis and Clark Exposition of 1905, a massive display of pageantry that reflected the importance of the fraternal order in the life of the city. 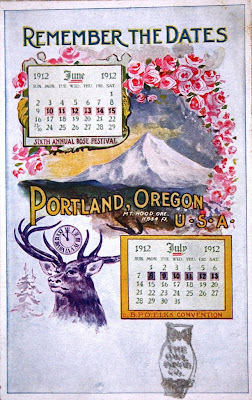 "Remember the Dates," the Rose Festival and the Grand Reunion. The Elks Building on the north east corner of 7th (later Broadway) and Stark. Today the corner is home to the United States National Bank building which was constructed in two sections, the first, that faces 6th, in 1917 and the second, that faces Broadway, (which necessitated the demolition of the Elks Building) in 1923. 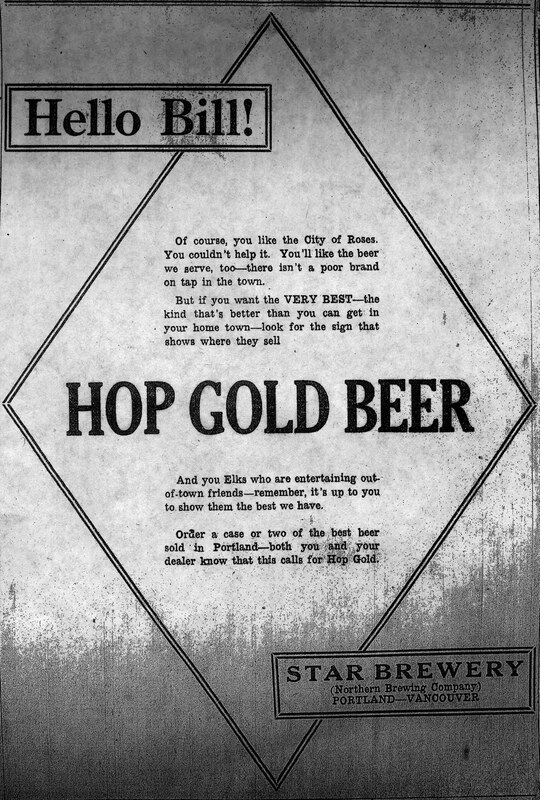 Railroads Report Between 85 and 100 Extra Trains"
-The Morning Oregonian, July 8 1912. Representatives from the country's 1,260 lodges arrived by the trainload at Union Station. The delegates, collectively referred to as "Bill" were greeted by their Portland hosts. Accompanied by bands playing and the singing of the song Hello Bill, they were paraded to their designated hotels. 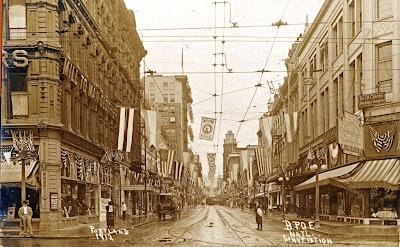 One hundred thirty five men and women from Sacramento alone were billeted at the Portland Hotel. Seventy five attendees from Chicago were based in the Imperial. At the Multnomah Hotel, the thunderous entrance of the delegation from LaGrande was said to have rattled the chandeliers. 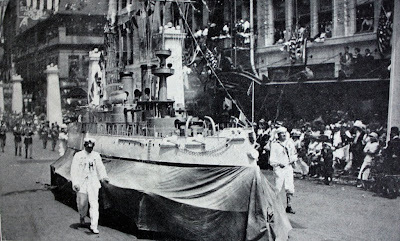 The arrivals were so frequent that the processions up 6th street were practically nonstop. The Elks were not the only visitors. 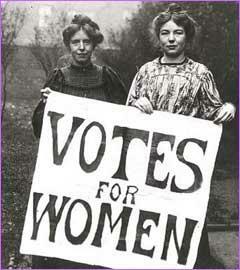 Into the maelstrom of riotous bonhomie arrived yet another cohort of true believers: the suffragettes. Hundreds of eastern delegates from the General Federation of Woman's Clubs convention held in San Francisco were returning home. At Union Station their special train was greeted by large crowds of Portland supporters who escorted them to the Multnomah Hotel for a week long stay in support of the Oregon campaign for Votes for Women. 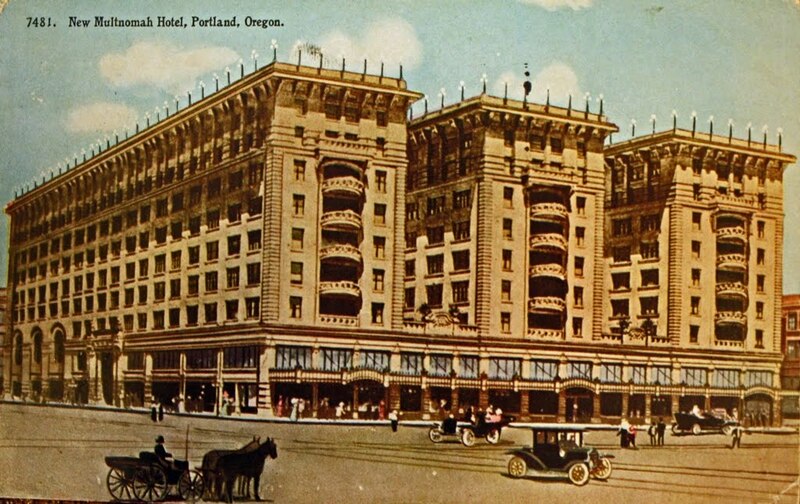 The Multnomah Hotel (today known as the Embassy Suites) which hosted both the suffragette delegation and the chandelier shaking Elks from LaGrande. The next arrivals came by sea. 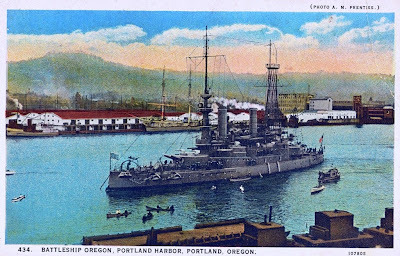 The battleship USS Oregon, still decades away from its role as a Portland waterfront museum piece, arrived with its attendant flotilla to its own boisterous welcome. On the first day alone of its visit to Portland, five thousand visitors were ferried mid river to the battleship Oregon. Conventioneers, sailors, suffragettes and locals swarmed the city with crisscrossing synergy. The same decorated interurban cars of the Portland Railway Light and Power Company rushed the suffragettes to the Chautauqua Grounds in Milwaukie and the Elks to a truly gigantic barbecue at Oaks Park that was attended by 20,000. 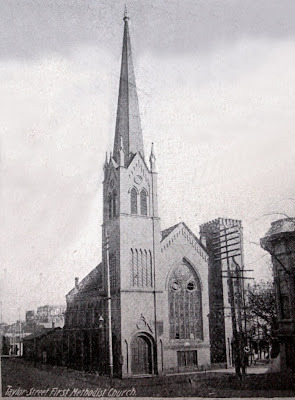 At the Taylor Street Methodist Church, young women chalked murals on the sidewalk to promote the suffragette cause to the morning crowds. Hotels, bars, restaurants and department stores hosted record crowds. Breweries ramped up production with special brews. The sailors did what the sailors do. The giant onion dome of the Chautauqua Auditorium in Milwaukie hosted many suffragette activities during the week. 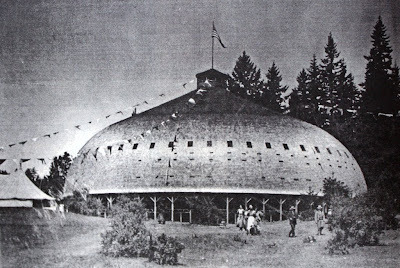 Built in 1895, near the interurban line to Oregon City, it could hold three thousand people. The Taylor Street Methodist Church on the south east corner of Third and Taylor. 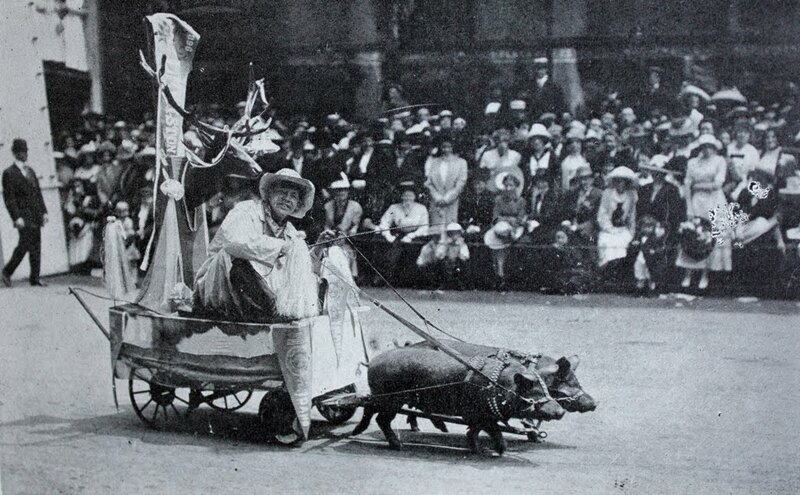 Prominent suffragette Frances Squire Potter addressed a large audience there Friday, July 12 1912. Young women spent the early hours of the morning chalking murals on the sidewalk in front of the church to draw attention to the issues and Potter's speech. An Oregonian advertisement for the Star Brewery's Hop Gold Beer, aimed at the Elks, aka "Bill." (click on images to expand). Convention week, looking west from the corner of Third and Morrison. 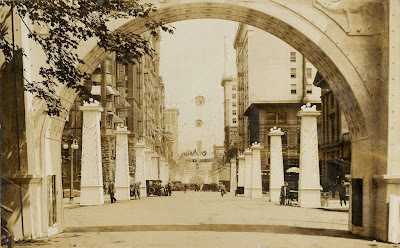 Three blocks to the right towers the doomed Marquam Grand, four months prior to the collapse of its east side on November 21 1912. Extensive as they were, the street decorations paled in comparison to those further up town. At the center of everything was the Court of Honor, which enclosed four blocks, on 6th, 7th, Yamhill and Stark streets with rows of pillars topped with globes and strung with white and purple lights. At each corner it was bounded by large white arches. The south east corner of the Court of Honor, looking north on 6th Street at Yamhill. 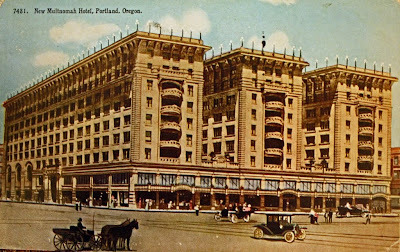 The Portland Hotel is to the left. The Pioneer Post Office (Courthouse) is to the far right. 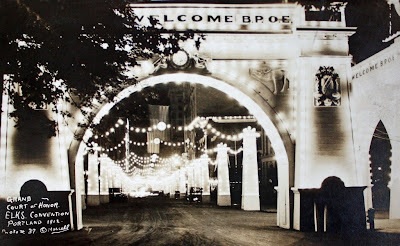 The gate at Stark street four blocks away can be seen in the distance. "This is a sample of the electric decorations- there are block after block of. It is beautiful at night." -a hand written message on the back of the post card above. The major buildings within and surrounding the Court of Honor were decorated with thousands of lights. 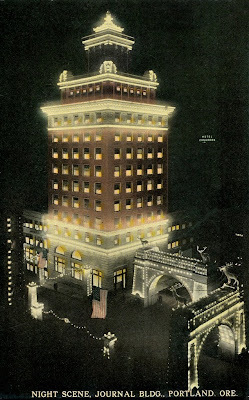 The courtyard of the Portland Hotel featured "an immense circle of electric globe lights" that extended to the top of the building. The Wells Fargo building boasted a lit clock face, 72 feet in diameter, with the hands set at eleven o'clock, the hour of Elk's remembrance. The Yeon Building was bathed in purple light on its lower floors, white on the upper floors and "Hello Bill" lit from the roof. 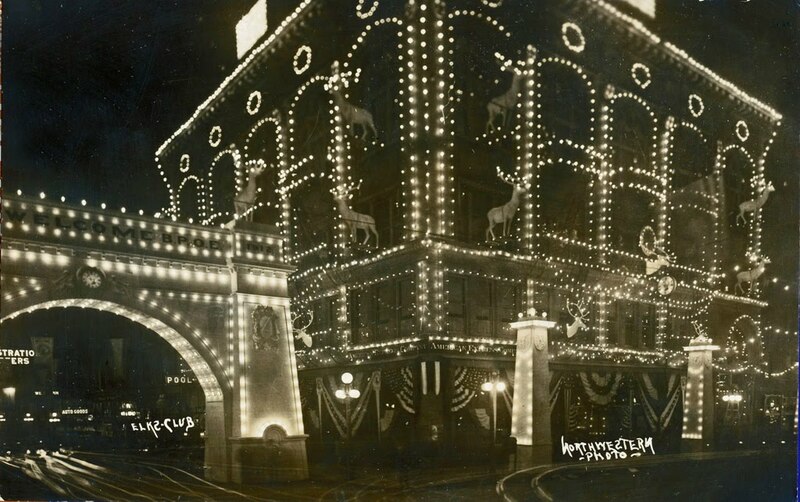 The Multnomah, Perkins and Imperial Hotels and the Lewis, Chamber of Commerce and Electric buildings were all noted for the lavishness of their decorations. The Journal Building, aka Jackson Tower and the south west corner of the Court of Honor at Seventh and Yamhill. 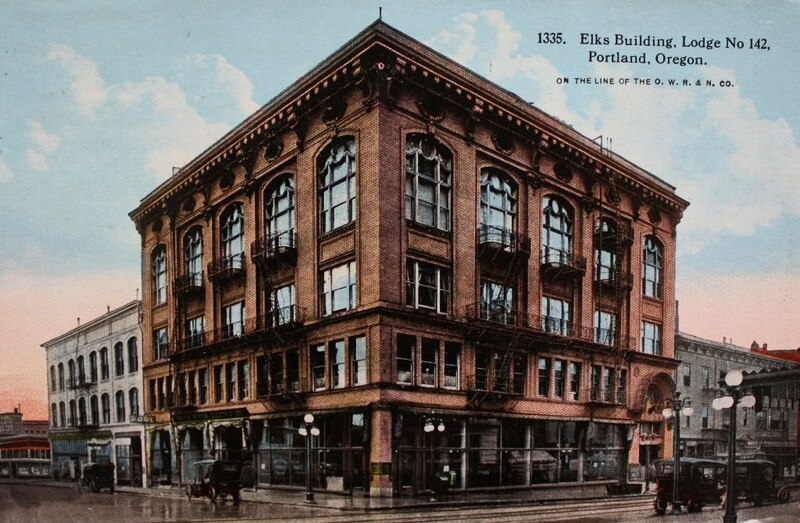 The Elks Building at the northwest corner of the Court of Honor, Seventh and Stark streets. "The Elk's Lodge machinery grinds on." Committees met, elections were held. 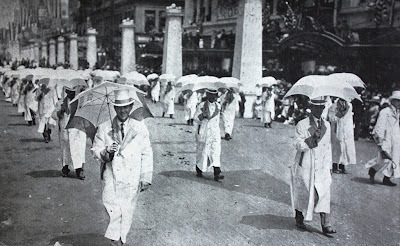 The true order of business though was revelry and pageantry as represented by processions and parades, small and large, impromptu and formal. Theater owner, impresario and future Portland mayor George Baker, true to his propensity to join everything, was a high ranking local Elk. He was put in charge of the two epic productions that capped the convention week. The first was a "electrical parade" that featured 18 illuminated floats (likely built from old streetcars and operated on tracks) held Wednesday evening and said to have been viewed by 250,000. 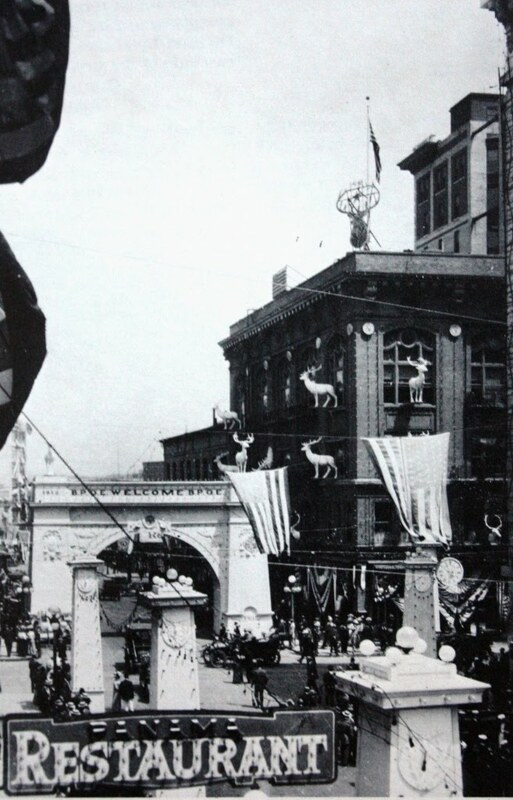 It was followed on Friday by the Grand Review: ten thousand marching Elks and 28 bands on a five mile route that straddled both sides of the river and was viewed by 300,000 spectators. The Grand Review marches down the Court of Honor. 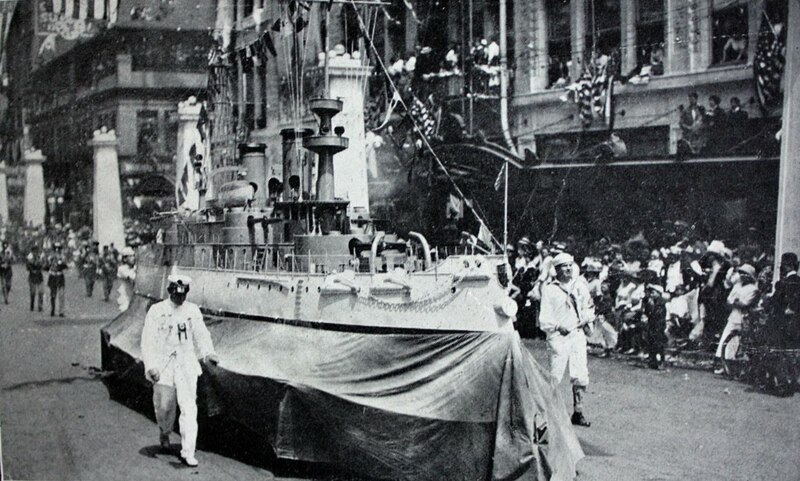 Sailors from USS Oregon with a large (and accurate model) of their ship in the Grand Review. (Winged ?!) Elks in the Grand Review. The building from where this picture was taken still exists. 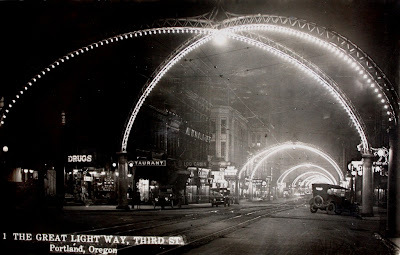 Borrowing a page from Dan Davis and his excellent Vintage Portland site, can anyone comment on where the location is? The next post will have the answer, and a current picture of the same place. At the week's end the conventioneers, the visiting suffragettes and the sailors were departing with memories of a boisterous, frenzied, enchanted city. To Portlanders the experience was more ephemeral; the decorations came down, a new work week began. Soon there was not a trace of the luminous spectacle. Still, it was not likely soon forgotten. It is hard to imagine that is was not somewhat on the minds of those who conceived of "The Great Light Way" on Third street less than two years later.